The vintage 1972 Blythe doll is 11-12" tall, has a large vinyl head with very distinctive luminous eyes and unique to this doll is that they change color too. She has a string with a ring at the end, that when pulled (pull it straight out horizontal, not downward), her eyes changed to a different color; purple or amber and blue, pink, green. Her tiny body is fully jointed and her hair is rooted, she came as a redhead, blonde or brunette. She wore a mod type dress with tall plastic boots. 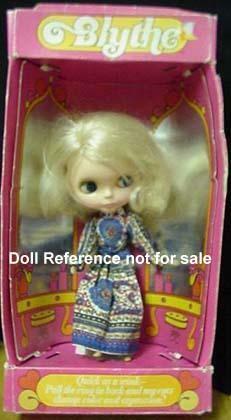 © 1972 G. M. F. G. I.
Blythe dolls were reproduced by Hasbro who bought Kenner from Tonka Toy and Takara of Japan also made Blythe dolls.